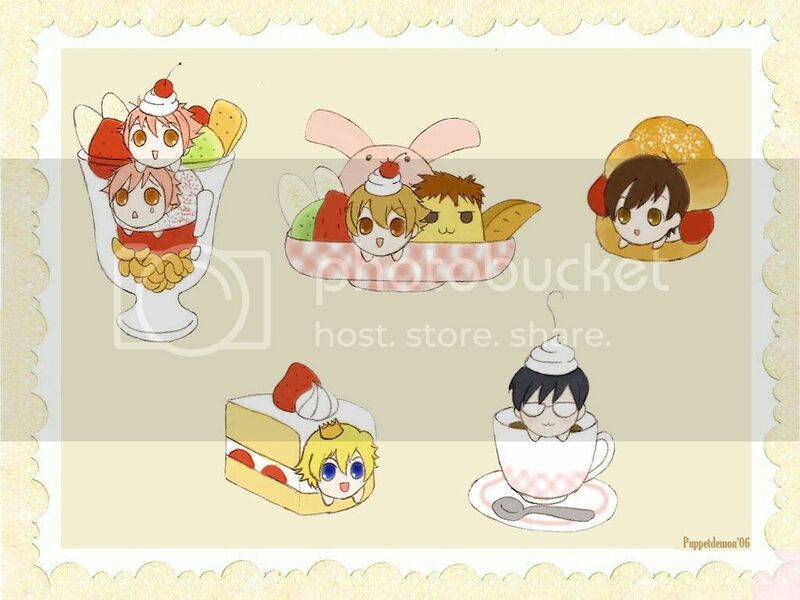 Nyanko-fied Ouran host club characters Including Twins Parfait, Hani Sundae (with Mori pudding and strawberry bunny), Haruhi Creampuff, King Cake, and Kyouya Coffee. I'll take the twins desert please! This is just too cute! One Hani Sundae to go, please! HAhahaha! OMG! Too cute! They give me the taste to eat. This is so cute! Can you please make more? Like into sushi? I'm probably going to try my hand with making them into little clay figures. food! XD they are so cute! kyouya with cream on his head.....WIN!!! Great job!! This is really cute!! Look at Kyouya and Mori....So random!! OMG Kyouya is so adorable! so YOU were the genius behind this!!! kyouya should be frowning. that would make it so much cuter!